Many issues, probably most in political science, have a strongly normative aspect – the legal status of abortion, the death penalty, gay marriage, how involved the US should get involved in Syria. Professors often can’t claim any sort of ethical high ground on these issues many times any more than the students seated in front of them. Then there are other issues that involve separating fact from fiction, science from political narrative. Some politicians and leaders for instance, may weave an intricate narrative portraying the history of human evolution as “lies. . . from hell” perpetuated by an elite increasingly bent on secularizing society. Many people really don’t understand the principles of evolution (which is kind of a shame, because the basics can be explained in like five minutes), but, rather, navigate their belief based on the dynamics of their social network and whom they have come to trust and believe in. It might surprise some, but global climate change theory has been around since the late 1800s. The premise that carbon dioxide absorbs and re-radiates energy is, as Nate Silver points out in his excellent book, The Signal and the Noise, a discovery that is from the era of the first light bulbs and internal combustion engines. This immutable fact of physics hasn’t changed and the more carbon dioxide (and other greenhouse gases) increase in the atmosphere, the more the total energy trapped in the system increases, all other things being equal. Anyone who disputes that the earth is becoming warmer would have to present a convincing theory about where all that extra energy is going. 2). All other things being equal, or ceteris parabis, may be the most important phrase in statistics. What qualifies a Nate Silver, or me, for that matter, to comment on global climate change? The answer is that it is a consummately statistical issue, and both us are trained in understanding statistical issues (he a little bit more than I). The beauty of statistics is that one can analyze particular causes while holding all other variables constant. Perhaps the most important thing that those suggesting that global climate change is “exclusively a natural phenomenon” don’t understand is this concept of statistical control, which allows data to be analyzed in such a way that any recognized and measurable alternate explanations can be taken into account. In other words, we know that greenhouse gases are causing global warming because the models underlying the research take into account natural temperature variations and statistically isolate them from the rest of the data in the same way that medical research can isolate the independent effects of smoking on life expectancy from things like age and socio-economic status. If the skeptics can come up with a variable that can be measured and incorporated into a quantitative analysis that accounts for a lot of warming that hasn’t been considered previously, then they might be onto something. In the meantime, however, there is no “gotcha, betcha-didn’t-think-of-this” argument concerning factors like solar cycles representing some mysterious previously unconsidered source of climate change. They’ve been considered, estimated, and incorporated into pre-existing models hundreds of time. 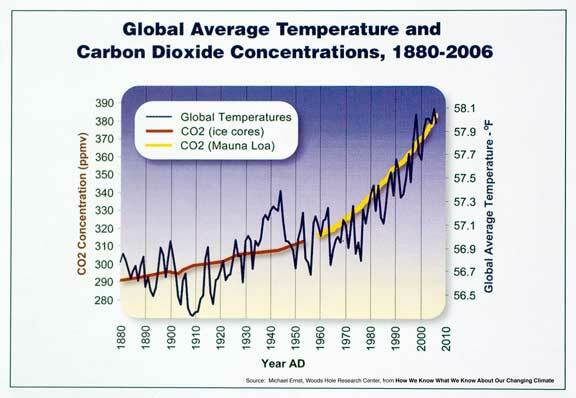 They have an influence over time on global temperatures, but they are not the only influence. 3). Global climate change is a very macro-phenomenon and you can’t personally observe it. At least most people can’t, unless they are old or in a particularly climate-sensitive location. You can’t look at a particular winter or summer, say it’s really cold or really hot, and think it’s going to provide any evidence for or against climate change. You can’t extrapolate changes in the weather in Indiana, or the United States (which makes up about 2% of the Earth’s surface area). No particular hurricane or drought can be attributed to it, any more than any one of Sammy Sosa’s 609 home runs can be attributed to steroids. 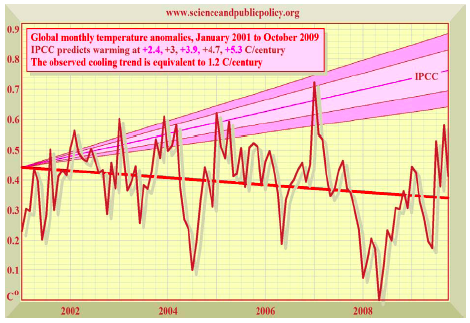 The appropriate way to look at temperatures is not with this graph or this graph, but with this one. No year or even decade tells the whole story. I don’t know what the weather is going to be two weeks from now, but it’s probably going to be warmer. From past data, this is a pretty good guess, but it might be wrong if something “fluky” happens to offset past weather trends. However, I can pretty much promise you that next month will be warmer as a whole than this month. Substitute decades for weeks, and months for centuries and you have climate projections. There have been a lot of indications that the last decade has had “flatter” temperature increases than many scientists predicted in the nineties. It’s not surprising that past projections would be wrong – it’s much harder to analyze future temperatures by simulating future data then analyzing information that has already been observed and recorded. Alternate factors affecting global climate change that have occurred in the past can be accounted for statistically because we know the extent of past changes in things like sea ice, cloud cover, and ocean currents. We don’t know precisely how and to what extent these factors will inhibit or re-inforce global climate change in the future, though. As more data is gathered, however, the climate projections should become better. That’s how science works – more data is better than less data. It’s appropriate to remain somewhat skeptical when presented with simulations concluding how much global warming will take place. But we do know it has almost certainly been occurring up to this point, and we know that global greenhouse gas emissions are accelerating. Nate Silver has a BA in economics. I hope you have more stats training than he does.